This page describes how you can personalize menus of your Oro application. The changes that you make via your personal menus page do not affect other users. If you are an administrator and want to configure menus for the whole system, please see the System Menus Configuration guide. This page contains a list of menus that you can configure. application_menu—This is the main menu of the application (also called navigation bar in the application settings). Via it you can navigate through Oro application. It is always displayed on every page. Subject to the configuration, it may be displayed horizontally or vertically. In the latter case, the menu items are displayed as icons. For more information, see Main Menu. shortcuts—You can find this menu in the top panel of the application, next to the organization name. Via it you can quickly perform common actions from anywhere. It is always displayed on every page. For more information, see Shortcuts. usermenu—This is the menu that you can access by clicking on your name in the upper-right corner of the application. Via it you can access your profile, emails, tasks and events. It is always displayed on every page. For more information, see User Menu. calendar_menu—This is a specialized menu that you can find on the My Calendar page. 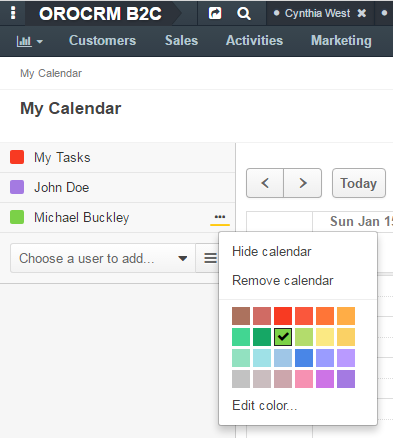 Via it you can change the displayed calendar color, hide or remove a calendar from view. For more information, see Calendar List. To view a menu, click the corresponding row or the View icon. 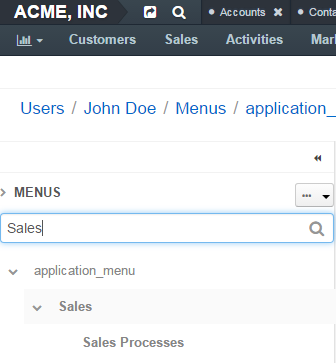 When you open a menu configuration, you can see a list of menu items in the left panel of the page. 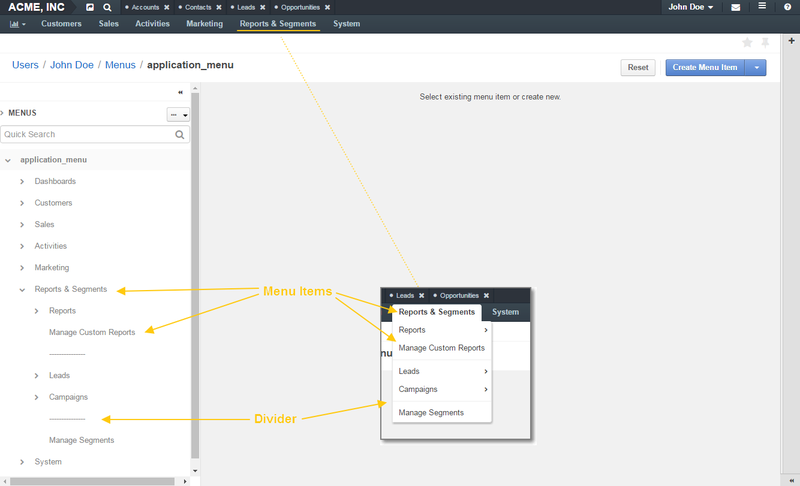 A menu can be multi-level (as a default main menu, for example) with child menu items nested under a parent menu items (e.g. Reports, Manage Custom reports are child menu items of the Reports&Segments menu item in the main menu). 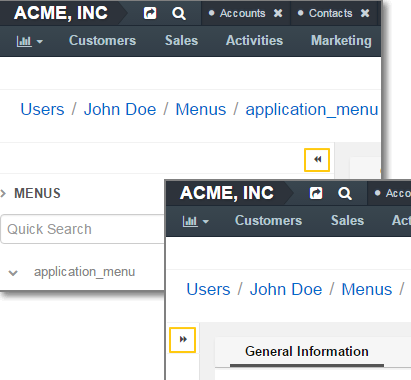 Menu items in a menu can be visually separated by a divider (a horizontal line). Dividers help you logically organize menu items. To minimize or maximize the left menu panel, click a double arrow in the upper-right corner of the panel. 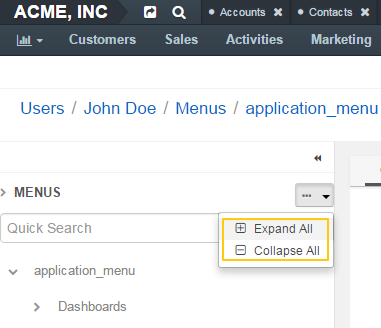 To expand / collapse all menu items, click the ellipses drop-down menu in the upper-right corner of the left panel and click Expand All or Collapse All. To quickly find a menu item, enter its name into the search field and click the Search icon or press Enter. 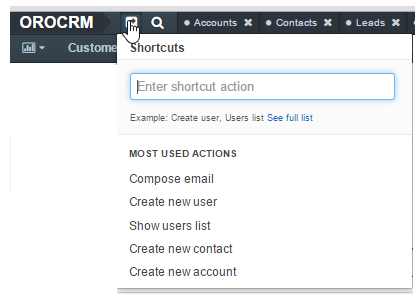 Click the Create**` drop-down in the upper-right corner of the page and click :**Create Menu Item on the list. The created menu item will appear as the last one on the list of children of the same parent item. You can move it to the position that you need as described in the Rearrange Menu Items / Dividers action description. You can specify an absolute URI or one relative to the application URI (as specified in Application Settings). If this menu item will serve as a non-clickable parent that does not link itself to any resource (like Customers in the default main menu), type #. Click Save or, if you want to start immediately create another menu item, Save and New in the upper-right corner of the page. Click the Create drop-down on the top right and click Create Divider on the list. The created divider will appear as the last one on the list of children of the same parent item. 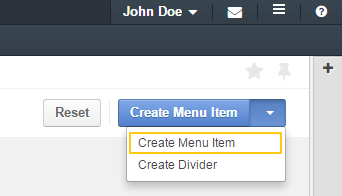 You can move it to the position that you need as described in the Rearrange Menu Items / Dividers action description. Click the Delete button in the upper-right corner of the page. Click the Hide button in the upper-right corner of the page. Click the Show button in the upper-right corner of the page. Click the Reset button in the upper-right corner of the page.